Beach Camp - Where is Beach Camp Located? Where is Beach Camp Located? 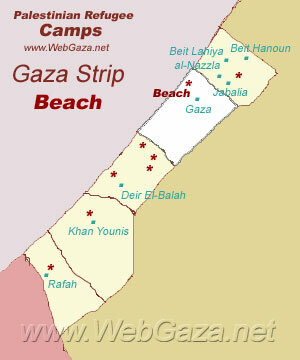 Beach camp lies beside the sea in the northern part of Gaza City. It is known locally as "Shati Camp". The camp was established on 747 dunums (less than one square kilometer) after the 1948 conflict for some 23,000 refugees from Lydda, Jaffa, Beersheva and the southern coastal plain of Palestine. The refugees first lived in tents and were assisted by relief organizations such as the International Committee of the Red Cross. UNRWA later replaced the tents with mud brick shelters in the early 1950s, and with cement block shelters with asbestos roofs in the 1960s. Today, rehabilitated shelters are being constructed with concrete blocks, some with two or three storeys. In 1971, the Israeli authorities demolished more than 2,000 shelters to widen the roads for security reasons and about 8,000 refugees had to move out of the camp into the nearby housing project in Sheikh Radwan. Prior to the closure of the Gaza Strip in September 2000 most of the refugees worked as labourers in Israel or locally in agriculture. Some refugees work in small workshops and sewing factories or are owners of small shops in the camp's market place while others work in Gaza City itself. A sizeable number of families depend on fishing for a livelihood. The environmental situation has improved considerably in recent years with the completion of UNRWA's new sewerage project and the paving of roads and the construction of storm water drainage channels. The project was supported by the governments of Japan, the United Kingdom and Italy. Sanitation work and the collection of solid waste is carried out by UNRWA labourers and in a quarter of the camp by Gaza Municipality. Water is supplied by Gaza Municipality and refugees are charged the same rates as city residents. The registered refugee population is 78,768 persons. UNRWA runs 23 schools (17 elementary and 6 preparatory) with 20,504 pupils enrolled in 2004/2005. Only 10 schools are run in a single shift. The women's programme centre was reconstructed in 1994. The centre offers services and activities for more 7,000 women and children yearly. A youth activities centre offering athletic, social and cultural programmes was reconstructed in 1994. A new community rehabilitation centre opened in April 1997 with contributions from the Government of Japan. It offers rehabilitation services to about 74 refugees with disabilities. 2,453 families (12,001 refugees) are eligible for relief assistance under the Agency's special hardship programme.